BPTP Astaire Gardens, Sector 70A, Gurgaon. BPTP Astaire Gardens, Sector 70A, Gurgaon., a photo by guptapromoters on Flickr. Astaire Gardens spread across 102 acres, offers independent floors, plots and villas in Prime Location Sector 70A Gurgaon. 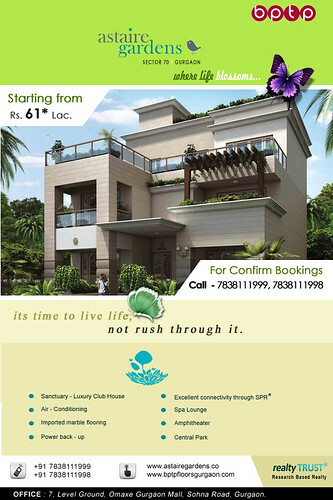 BPTP launches a township Astaire Gardens in Sector 70A. Perfectly located, easily approachable from Sohna Road as well as NH-8 through the upcoming SPR, BPTP Astaire Gardens township will offer the most comprehensive living environment. And at an incredible price : an entry threshold of less than 60 lakh !! The self-sufficient township has intelligently designed air conditioned homes with best-in-class quality.